Fortunately it was possible to re-chrome the sidelight/indicators. However to do so ACF Howell had to remove the bulb holders and reflectors, neither of which faired out too well during the removal process. The other problem was that one of the lens screws had sheared and I’d forgotten to remove the remaining section prior to sending everything to be re-chromed. So not only was it corroded in place but it was now sealed with a layer each of copper, nickel and chrome. It was carefully drilled to break the plated layers and soaked in penetrating oil for weeks before attempting to remove it using a left handed drill bit. It wouldn’t budge so there was no alternative except to drill it out and re-tap. Fine in theory but the lens screws are an odd size (approx. 0.130″ diameter and 32tpi). None of the local machine shops had a suitable tap and various internet searched failed to find one too. The closest tap was 6-32 at 0.136″ diameter which will now require a different size screw. The next challenge was to find some new bulb holders which also proved to be very elusive. I finally managed to find some at the Stoneleigh spares day on a stall offering headlight re-silvering for very old classics. The side lights require a bulb holder to fit a 5/8″ diameter hole while the indicator is for larger a 7/8″ hole. Once in place, the bulb holder edge is peened over to secure it in position. The metal body of the light unit acts as the earth connection for the bulbs. A good earth would probably be achieved just by the four mounting screws, as the whole of the lower bonnet panel is earthed directly from the bonnet plug. However a brass bullet connector ring is also fitted to the indicator bulb holder and wired to the earth running in the loom. The indicator bulb holder is much harder to fit than the side light as the holder edge needs to be peened over tightly so the earth connector at the rear and the reflector inside aren’t wobbly. I rigged up a method of clamping the rear which took care of the earth connector. The reflector could then be held hard against the unit while a metal rod was tapped to peen over the edge of the holder. An additional pair of hands would have been very useful! The disadvantage of someone else dismantling the units is not being able to recall what was removed. As a result, I’d overlooked the re-fitting of the internal shield. Fortunately it’s simply secured by two 2.4mm rivets and once in place, creates separate indicator and side lamp compartments. I thought the rebuilding of the units would be fairly simple rather than the palaver it turned out to be to get replacement parts. It took three attempts to get the lens seating foam from SNG Barratt. Each time they were ordered I received the gasket for the side reflectors only found on US cars. Eventually we found out that my copy of their catalogue had a typo! Fortunately the rubber boots fitted over the rear of the holders were in good condition as they’re not available any more. I also had to remake all the sprung bulb seat connectors as the wires were way too short. Still that would be the least of my worries …. all the chrome units had been sent to Hutsons specifically so they could be trial fitted and the body work adjusted prior to painting. Both indicators were miles out and clearly hadn’t be fitted before the bodyshell was painted and the lights sent on to be re-chromed. Really not impressed. It appears that the holes for the indicator units in new bonnet panels are approximate and need to be fettled quite extensively. I therefore had no alternative – I’d have to take a grinder to my painted bonnet to open out and reshape the hole. The accuracy of the bonnet panel is also amiss as I’m certain the indicator inserts haven’t been welded into the bonnet squarely. The other odd thing is that only two of the four mounting points have nuts welded to the bonnet panel. Once the headlights are installed there won’t be access to the rear of the units. So I’ve had to fit some spire nuts in these holes. The mounting holes in the indicator units also had to be enlarged to try to overcome the alignment problem. Even so, I’ve not been able to mount the units a horizontal as I would like. It’s something that will bug me now! The breakdown of the re-chroming quote received from ACF Howell simply had ‘RIP’ written in place of a cost for the rear light clusters …. and I had thought they looked in better shape than the front lights, which they were able to re-chrome! I was therefore slightly weary of picking up some second hand ones at the Stoneleigh spares day, just in case they too were later found to be beyond help. The general view is that the aesthetics of the S2 suffered with the tightening of US health and safety regulations, by the introduction of the rear wrap-around bumper and rather slab rear-end look. They have a lot to answer for!! 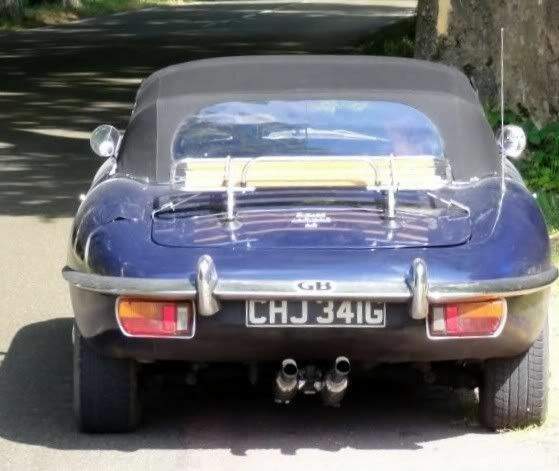 Peter Crespin, an author on Jaguars, had ‘tidied’ up the rear of an S2 based around using the rear light clusters from a Lotus Elan 2+2. These have a reverse light incorporated into the unit thus removing the need for the separate reverse lights either side of the square number plate. The number plate mount and aluminium number plate finisher are also dropped enabling the more traditional oblong number plate to be attached directly to the body. This in turn enables straight exhaust resonators to be used rather than the splayed ones introduced with the S2. While I much prefer this uncluttered look, I still wanted to be able to revert to standard relatively easily/cheaply. The main expense is the rear light clusters so the decision was whether to buy the correct ones or the Elan 2+2 units. The problem would be that having separate reverse lights might obscure the ends of the number plate. A quick call to Framptons confirmed that they would be able to produce an oblong number plate which would fit inside the original reverse lights (just! ), because my registration number only had two digits and one of these was a ‘1’. Decision made. I would stick with the correct light units and the reverse lights but would swap to an oblong number plate and straight exhaust resonators. One of the rear housings for the light units had been pushed in and badly twisted. Presumably when it sustained the rear bumper damage. Fortunately I managed to find a pair of second hand ones although their hand-painted finish looked as though the previous owner had had a fight with the paint brush …. and lost!! Nothing some shot blasting couldn’t cure. The replacement housings may well have been from another Jaguar model because they didn’t have the retaining nut on the rear face and new ones had to be welded in place. The paint had been masking some quite bad pitting, so the housings were left to soak in phosphoric acid for a while to convert any remaining traces of rust before being filled and painted with Epoxy Mastic 121, along with the final few unpainted parts. I also decided to give the inside of the housings and the back of the light clusters a number of coats of Dinitrol hard wax in an attempt to delay the onset of the same corrosion problems in future. Several thick coats of Dinitrol were applied – initially it looks a mess but dries overnight to a thinner, more uniform finish. The parts diagram indicates that there should also be a foam gasket (item 5) sealing the aperture where the lamp cables exit the rear housing. Despite numerous searches, I couldn’t find anyone who supplied them so I knocked up some gaskets using some Dynaliner. The foam is closed cell so shouldn’t absorb water which would making things worse rather than better. First the light housing must be attached to the body. The inboard side with two 3/16″ setscrews, one securing the light’s earth connection, and the outboard side with two 3/16″ self tappers into a square nylon span-in nuts. However I found that once the housings had been fitted, it wasn’t possible to fit the bolts securing the rear bumpers. Therefore these bolts need to be screwed in place beforehand. The bumper brackets slide onto these bolt so it’s not necessary to fit the rear bumper first. Although access to the bolts starts to become limits once the light units have been mounted to the housings. I’ve found Bresco very useful for supplying many of the odd trim fittings and they supply a pack of the Nylon snap-in nut for 17/64″ square hole (code 80200P), which is sufficient for the rear lights, the reverse lights, the padded door brackets and the brackets for the internal door lever operating the door locks. Oddly the inner two bolt holes of the reproduction light clusters were tapped. This didn’t make sense to me as it would stop the bolts providing a clamping force on the clusters against the housing. Once the screw had engaged with the thread in both the light cluster and housing, they would move in unison along the screw thread and would not be drawn together. In the end I gave up and drilled the bolt holes to remove the screw thread to obtain a good seal on the rubber gasket between the two. Finally the reverse lights and number plate light were screwed in place to complete the rear lighting. The separate wiring loom for the starter solenoid relay was sent off to Autosparks so they could have a look and use it as a pattern to make up a new loom. In the meantime, I’d posted my wiring dilemma on the E-Type forum to see if others could shed light on the relay wiring. A fellow S2 owner kindly pointed out that there was a change to this area of the wiring during the S2 production run. As it happens, at exactly the same time my car was passing through the factory. I guess that it hadn’t been reflected in the service manuals because the modification had been made mid-production run. Around the end of ’69, a ballast resistor was introduced into the ignition circuit with the aim of improving cold starting. The original 3 ohm coil was replaced by a ballast resistor and coil wired in series, both being around 1.5 ohms. When the ignition switch is turned to start the engine, the starter relay activates, delivering power to the starter solenoid but also bypassing the ballast resistor. Therefore when starting, the full 12 volts is applied to the coil. The spark energy is increased over the original setup as the current flowing into the coil is greater due to the lower coil resistance. Once running, the ballast resistor is introduced back into the circuit. As the coil and ballast resistor have a similar impedance of around 1.5 ohms, the voltage drop across each is roughly the same. Therefore a voltage of 6v is applied to the coil during normal running. I found the wiring diagram above on one of the American Jaguar sites which shows the wiring connections for ballasted cars. Autosparks also confirmed that they stock this ‘ballast resistor’ loom. Although I think I’ll get the car running before I cut and tape the unused wires in the main loom! It was a good opportunity to get Autosparks to make up the additional wiring, using the correct colour coding, that I needed for the few upgrades I’d planned – the mechanical brake light switch to supplement the hydraulic switch and the boot light. There was also a number of wires that I believe are missing from the sundries wiring pack, such as earthing wires for the rear light clusters and a beefier jumper wire between the two brown fuses. Touch wood, I’ve now got everything to complete the wiring. Alas, it was again a case of one step forward and two back. Very early on in the work on the bodyshell, the LH outer pedal side panel had been replaced where the main loom comes out behind the voltage regulator bracket. The panel was from one of the main suppliers of panels so I foolishly assumed it would be spot on. It was only once I came to fit the voltage regulator bracket that I found out that its mounting holes had been punched in the wrong place. They were about 5-6mm too close to the sill closing panel so that the bracket doesn’t fit. The bracket did change for the S2 cars so it might be that the panel also changed and I was supplied the wrong part. Either way – not happy! I should have checked it well before it had reached the paint shop. It’s not the end of the world but it will always niggle me as I’ll know it’s not correct on the car. The annoying thing was I’d spent ages sourcing and refurbishing a replacement bracket, as the studs on the original had all sheared trying to remove it. The first replacement was purchased from SNG but the fitting was incorrect, using bolts rather than attached studs. Some time later, I managed to get a rather tatty one on eBay which was covered in a mixture of black and green paint. It took several applications of Nitromors and wire brushing before it was good enough to be re-plated. The problem I find with zinc plating is it’s too blingy (although I’m sure the brightness would dull slightly once exposed to the elements). I decided to experiment and sprayed it with a two-pack clear satin lacquer. The results were even better than I had hoped/expected. The satin finish obviously tones down the brightness but it also has a softer, smoother to the touch feel and a more uniform metallic finish. After all that effort I didn’t really want to start butchering a perfectly good original part to fit. instead I planned to trim the original bracket to fit and then repair the welded studs but SNG Barratt now supply the brackets with the correct studs relatively cheaply. So I’ll adapt one of their repro parts rather than an original part. I think I’ll also spray most of the plated parts in the engine bay with the clear satin lacquer. Hopefully it will also provide a more durable finish.